Which seems to be as good a reason as any to celebrate your country. My family visited Iceland in January 2010, on a layover when we were traveling back home to Vancouver from Stockholm with Iceland Air. I'll be traveling through Keflavik Airport again this summer, but unfortunately won't have time for a visit. I do hope to go back for a more extended visit at some point, because it's a spectacular place to visit. It's definitely not like any other place I've ever visited, what with the hot springs, the tap-water tinged with sulphur, barren landscapes with volcanoes rearing up, and a capital where the streets are kept ice-free in winter thanks to geothermal heat. 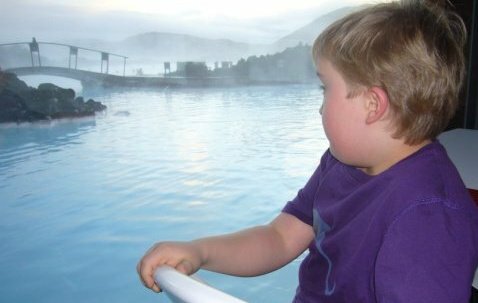 This spa and outdoor geothermal pool was my kids' favorite stop when we were in Iceland, and I loved it too. The facilities are top notch, the pool is huge and the water is warm enough to melt away what ails you. It's also steamy enough that my daughter decided dragons lived in it: I kind of like that idea. This restaurant on Laugavegur, the main shopping street in Reykjavik, is friendly and cozy, and serves great food for adults and kids. The lamb and seafood dishes were great. It's my favorite type of restaurant: not so fancy that you feel out of place wearing jeans and bringing kids, but still serving well-made, tasty and original food. The Reykjavik Zoo was my kids' second favorite stop, after the Blue Lagoon. The animals are mainly Icleandic farm animals, including lots of very shaggy and very pretty ponies, and other Nordic animals like reindeer and seals. There's a small restaurant/cafe that serves light meals (my kids loved the waffles) and a tent with science-related, hands-on activities for kids. 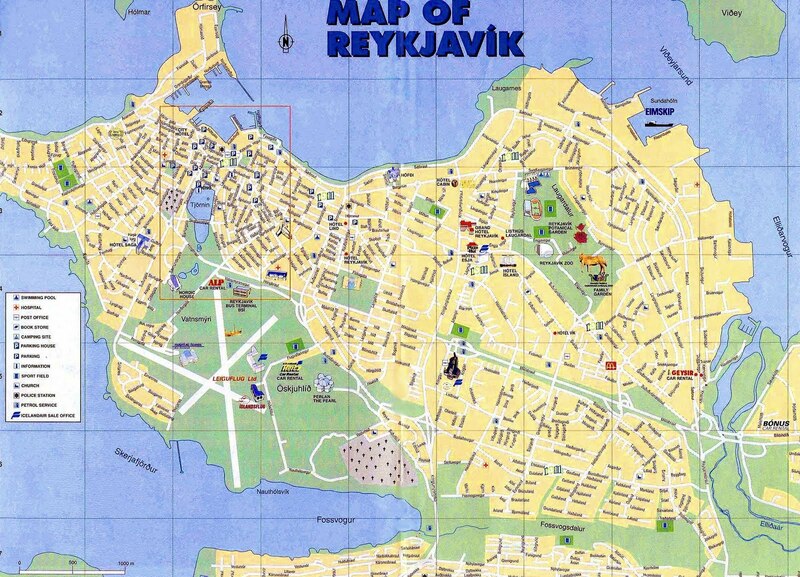 The Old Town in Reykjavik is not very big and well-suited to walking with kids. There's a lot to see as well, including the Old Town, the harbor, museums and churches. Even when it's cold and icy and snowy (as it was when we were there), the streets in the center are kept free of ice because they're heated from below: geothermal heating is a nifty source of energy! Fodor's Travel has a nice 90 minute walk you can do in the Old Town, and there's also a free guided walking tour of the city that you can hitch on to. Download a free map of the city here. Statues outside Perlan. Midwinter sun in the background. Perlan is the spacy-looking dome located on a hill above the city. The building is a sight to see and the view is spectacular. We didn't get inside on our visit because the place was closed for renovations, but even just going up there for the view was worth it. Lots of space for kids to run around and play outside too. There are many bus tours that leave from Reykjavik and take you out to various points of interest around Iceland. viator.com has a nice list of 30 different tours that you can go on. There are a lot of natural wonders to see: geysirs, lagoons, whales, waterfalls, volcanoes... just take your pick! You can ride the Icelandic ponies at the Zoo, but if you and your kids want to go for a more "real" ride, there are also places that offer various kinds of horseback riding tours. One place that offers a wide variety options is Ishestar (Ice Horses) outside Reykjavik. There are whale watching tours (that may include puffin watching as well) that leave from Reykjavik, and you can also take a 5-minute ferry to Videy, a small island near the city. Videy has hiking trails, a fishing village, wild birds, and a peace memorial designed by Yoko Ono (how random is that?). There are a lot of sheep in Iceland, and therefore a lot of woolly souvenirs to buy. In Reykjavik you will see lots of yarn shops, and a lot of woolly hand-made goods such as knit sweaters, knit hats, mittens, and socks. Some of it's pricey, but the quality is generally very good. Also, socks, mittens and scarves can be had for a lot less than the "traditional Icelandic sweaters" and will keep your kids nice and warm. WhyGoIceland has some other good tips on what to buy when you're in Iceland. Rent a car and drive around, or catch a bus out into the great wide open, slightly forbidding landscape of Iceland with its rocky plains and snow-capped mountains. There's something oddly compelling about the place, like visiting another world. If you and your kids are into hiking, there are a lot of trails in Iceland of varying lengths and difficulty. Nordic Adventure Travel is one good online hiking-trail resource.